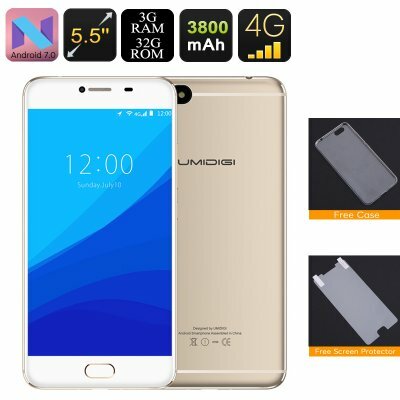 Successfully Added UMIDigi C Note Android Smartphone - Android 7.0, Quad-Core CPU, 3GB RAM, Dual-IMEI, 4G, 13MP Cam (Gold) to your Shopping Cart. The UMIDigi C Note is one of the latest Android phones that comes at an affordable price. This cheap smartphone runs on an Android 7.0 operating system which helps it deliver a smooth and powerful performance. Treating you with the latest software features available, you’re guaranteed to undergo a great user experience with this Android phone. With its two SIM card slots and Dual-IMEI numbers, this mobile phone takes your connectivity to the next level. Being able to be reachable on two phone numbers at once, makes this Android smartphone perfect for the busy business people among us that like to separate their work and private life in one cell phone. When looking at the sleek body of this beautifully designed smartphone your eyes will directly be drawn to its stunning 5.5 Inch Full-HD display. Featuring SHARP technology, this display will deliver breathtaking 1080p visuals that come paired with great detail and vivid color. For all mobile media lovers among us, this Android phone brings along tons of opportunities. With access to the Play Store, this Android phone lets you download unlimited applications, games, and media for you to enjoy. With 256GB of external memory support, there is no need to worry about running out of storage anytime soon. Supporting 4G and Dual-Band WiFi, this Android smartphone lets you browse the web at lightning speeds and download the latest games and applications in a blink of an eye. The latter can be enjoyed effortlessly as this powerful hardware is capable of handling the most demanding software without dropping a frame. With its Quad-Core CPU and 3GB of RAM in place, this mobile phone handles games, movies, and applications without you needing to worry about slowing down your device. For all smartphone photography lovers out there, the UMIDigi C Note packs a mesmerizing 13MP camera. It furthermore comes with a sophisticated 5MP front snapper which is great for taking selfies with your friends or for engaging in online video calls with family. Thanks to this beautiful Android smartphone you can be guaranteed that not a single special moment in life ever passes by again uncaptured. I love this phone because it's beautiful and powerful. UMidigi C-Note got everything ive been looking for a phone! Dual IMEI and CPU is really good. None. I couldn't find one.